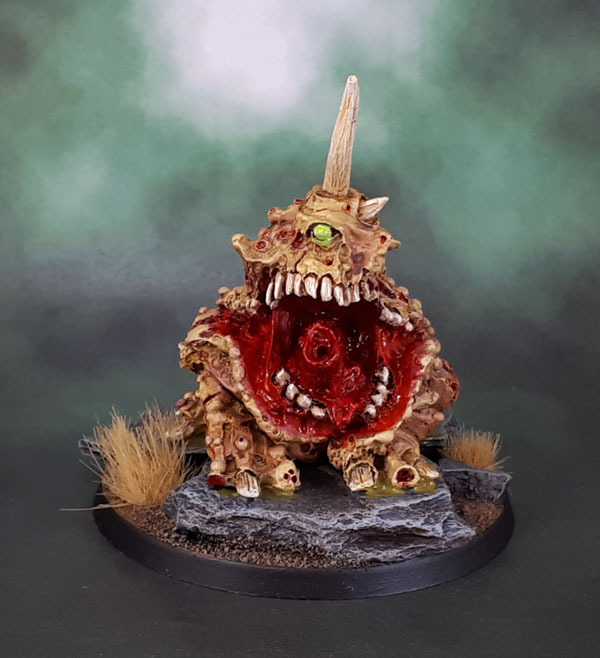 Warhammer Fantasy – 9th Age | Azazel's Bitz Box. 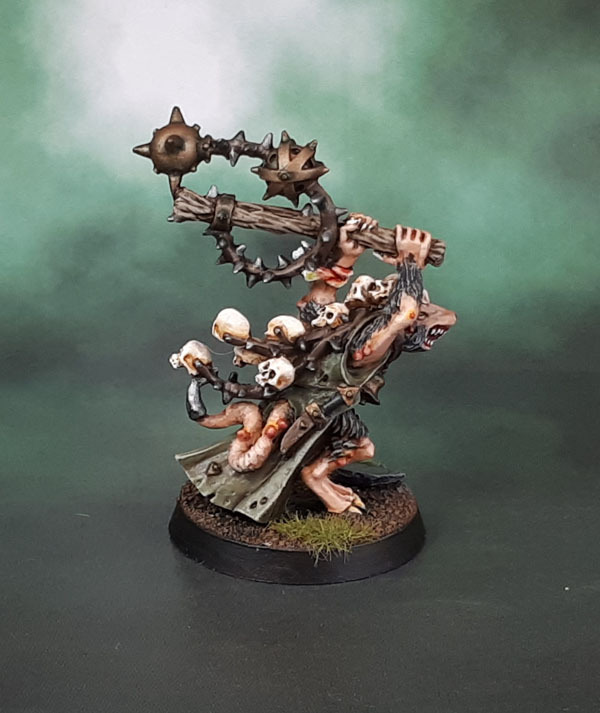 And here’s the unit that goes with yesterday’s Skaven hero for the AoS challenge. As with the hero model, these models were absolute cunts to paint and really not fun at all. They’ve butted up against a ton of Neglected Model and Unit Challenge months over the past year, with no success. As I said in yesterday’s post, the fur+skin style is the opposite of enjoyable to paint, so I hope I don’t come across any more of this generation of metal skaven models in my box’o’skaven, even if I’m actually pretty satisfied with the final product. 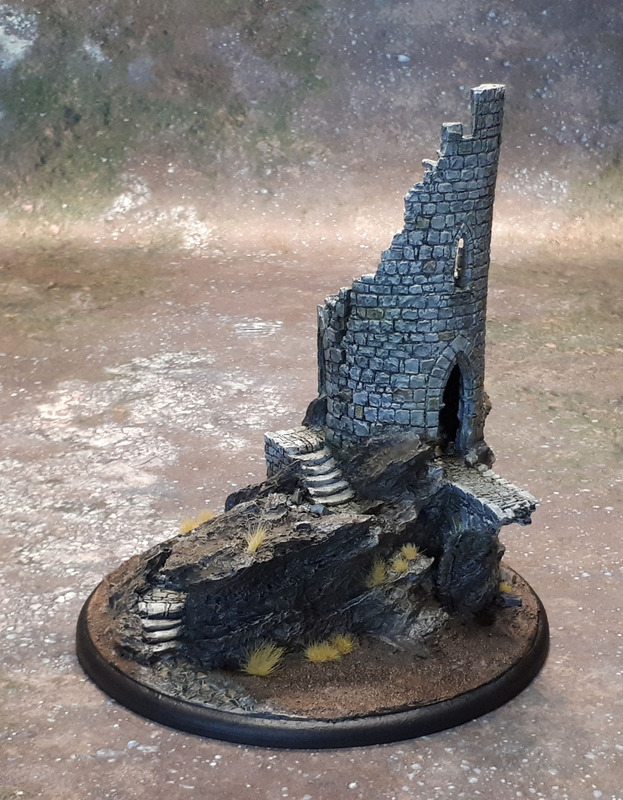 Fist-bump to Wudugast as well here – his relentless work in painting and sharing his own skaven has been the biggest thing causing the constant niggle to keep on trying to get these done. And finally(!) – I got there. 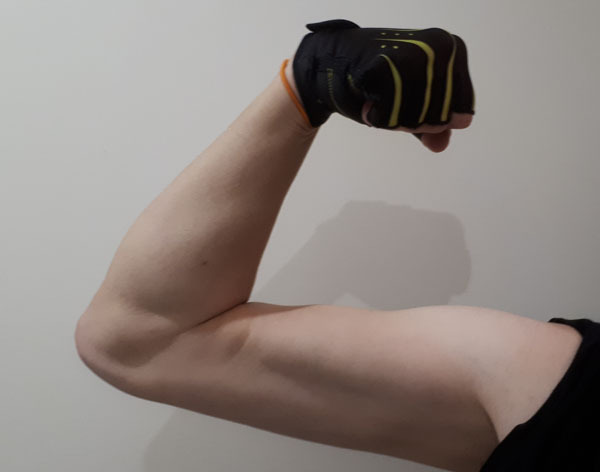 Thanks for the inspiration, mate! Group shot to conclude! No more for Alex’ AoS challenge this month unfortunately (despite my best plans), and the Round-Ups will be delayed a little this month. More on that later, though. (I’m typing this on Saturday evening). Monday Edit – Also, another couple of submissions for Monster March just need photographing, then they’ll be going up in the next couple of days! What? Who has gamer ADHD? Yeah, well… today’s model is one that’s been serially neglected for a couple of years since I got it with a batch of models off of eBay. I unfortunately found this model and the other skaven of a similar nature complete motherfuckers to paint. 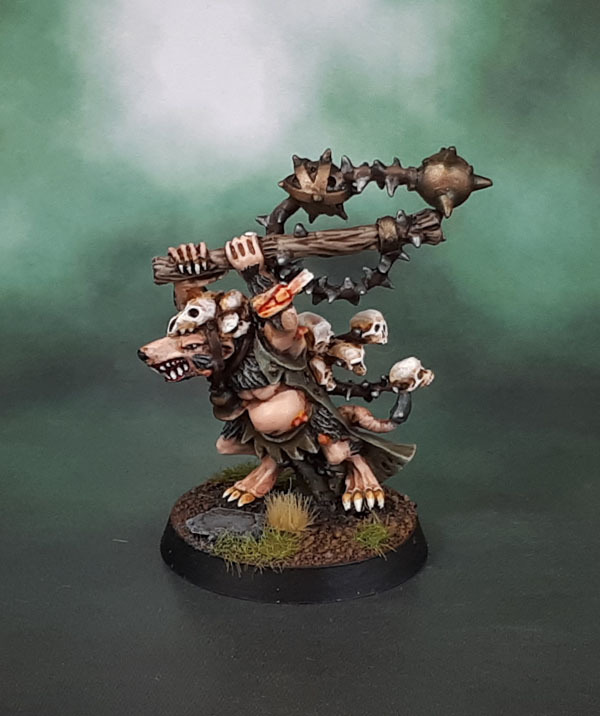 The semi-furred style that replaces Jes Goodwin’s fully-furred skaven, combined with a fuckload of details just made this style of Skaven a nightmare to paint. It scrubbed up pretty well in the end and I’m pretty happy with the final results, but it wasn’t an experience I enjoyed or wish to repeat anytime soon. Or ever, to be more blunt. 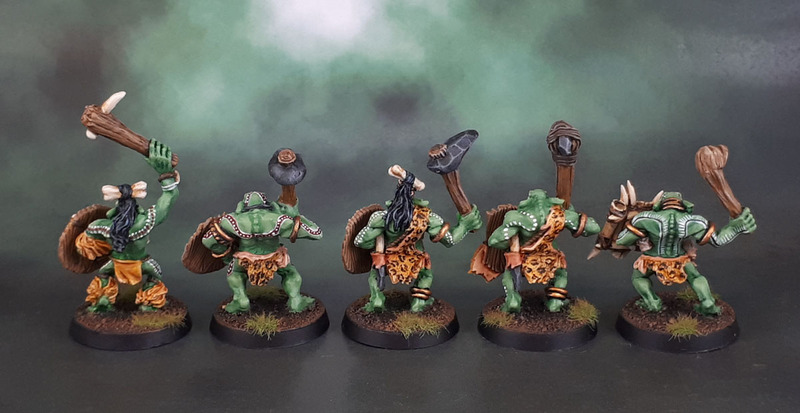 Anyway, because reasons I’ll go into later one way or another, I didn’t manage to get any of the other models I originally hoped to completed for the very cool concept of growing a few small AoS warbands. 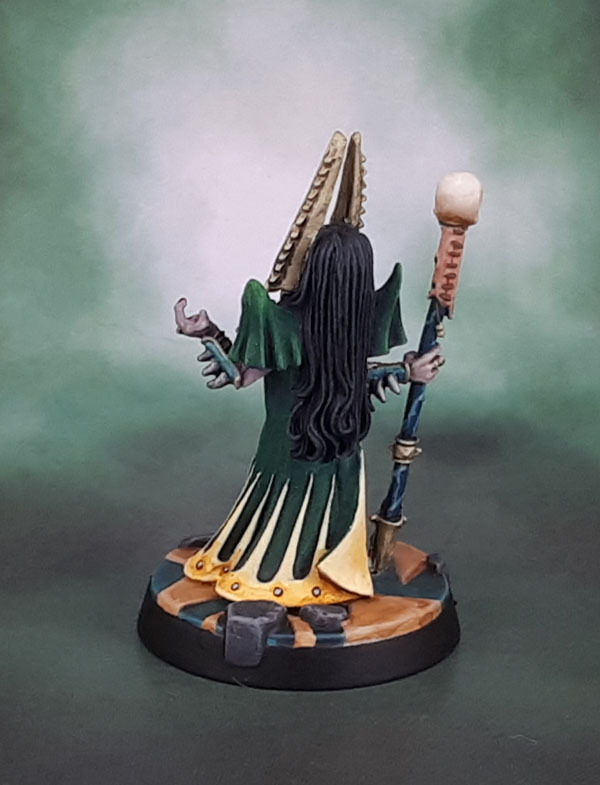 I have the next batch of dark elves primed, as they have been for a couple of weeks now – and the beastmans shaman still sits untouched since January, and the next few savage orcs have had a small amount done to them, but we’ll have to see how April pans out. Hopefully, I’ll be able to get back into the swing of things. Today’s model is also my slightly-delayed submission for Alex at Leadbaloony’s Fembruary 2018 painting challenge. 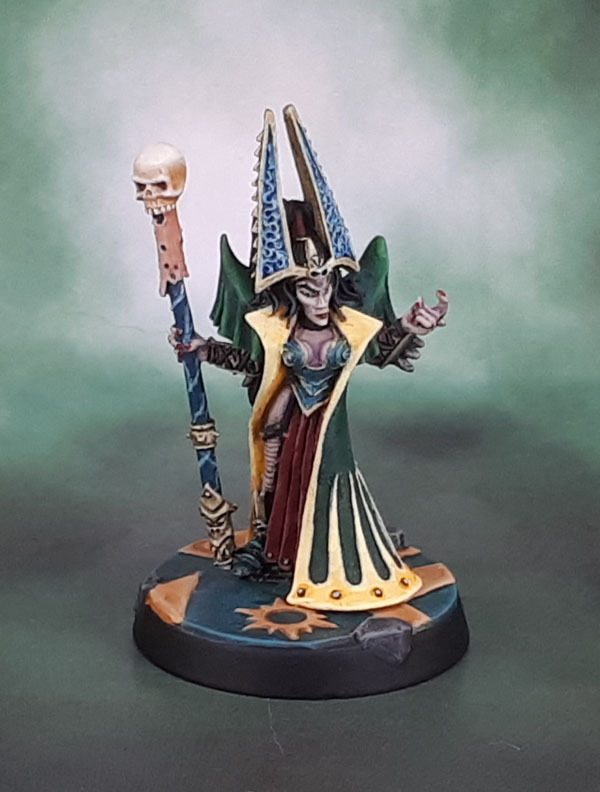 Originally, I’d hoped to get a few other models done in time as well, but with how February turned out, I’m actually quite happy just to have finished off Morathi to a this standard. 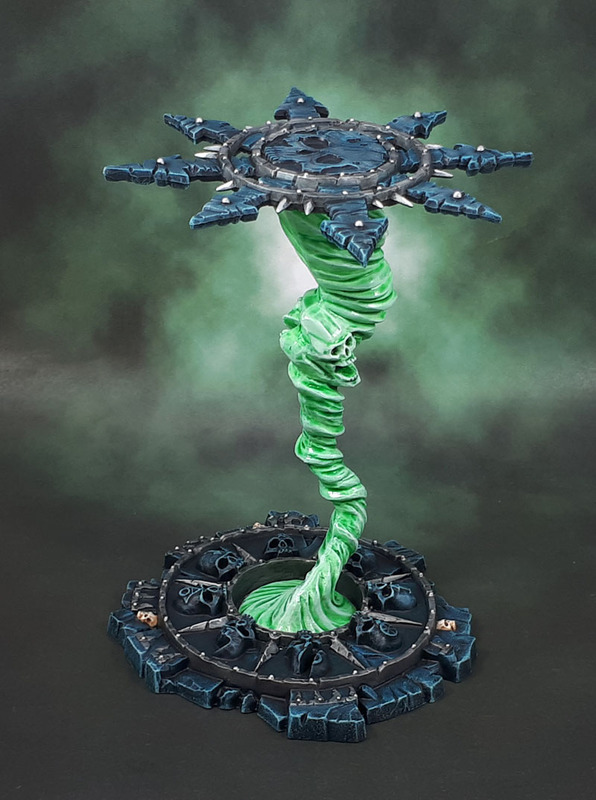 The palette I’ve chosen for Morathi is around the overall scheme that I’m doing my Dark Elves in, which is to say a lot of Turquoise and Aqua, with use of the blues and greens to each side. 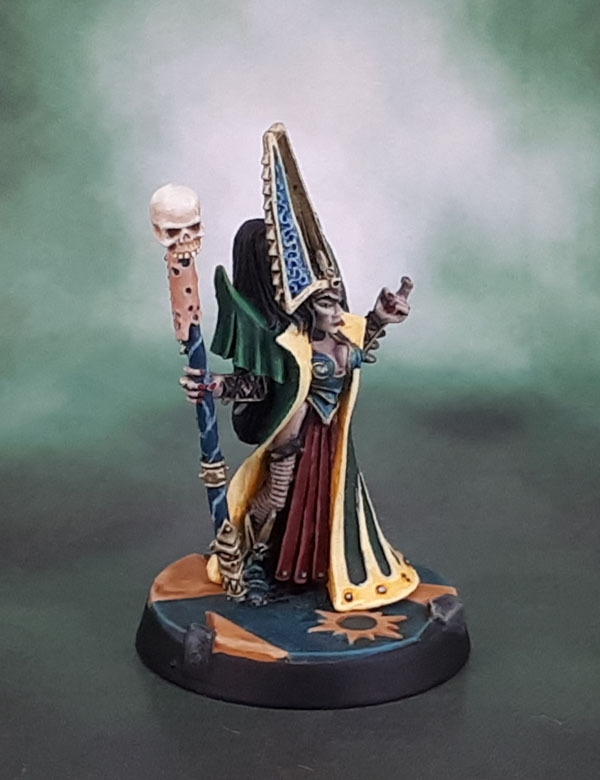 I’m also going to call this model the beginning of another AoS Skirmish warband, and shoehorn it into Alex’ other group project as my only other painted Dark Elves are limited to a pair of Assassins and a pair of Bolt Throwers that lack crew. Warbanding them up a bit more seems like the perfect motivation to getting a few more of these models painted! Here’s my next few Savage Orcs. 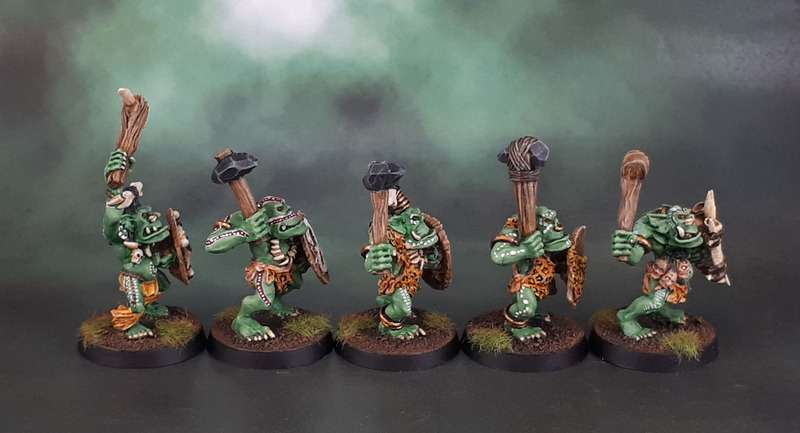 They’re a mix of the Alan Perry Orc models from ’95-96 and then the later batch released in ’98 – though to be honest they were probably all sculpted around the same time by the look of them. I’ve (naturally) got a whole lot more of them to get to and through, but these at least are now finished. 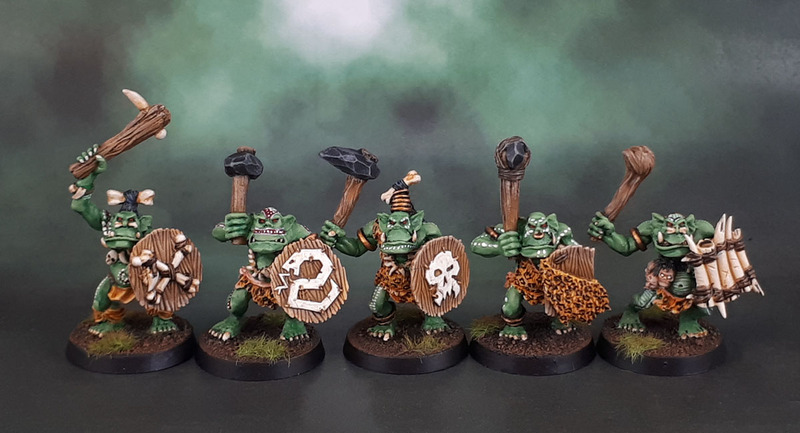 The shields are taken from the current range of Savage Orcs/Orruks and with a tiny bit of cutting and drilling have been made to fit these older models. Being from the mid-late 90’s they’re not considered “real” “Oldhammer”, but being 20 years old, they’re still far from new! Obviously and firstly, they’re Neglected Models. They’ve been sitting, basecoated (badly, by someone else) in a Chessex case since the early 2000s at best until very recently, when they got taken out of there and basically redone from scratch – including new bases – simply using the old basecoat as a coloured undercoat because if I stripped them, I’d never get around to painting them. 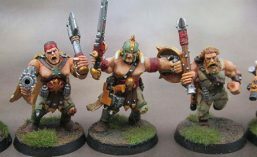 Secondly, they’re a small unit that I managed to actually complete – and so Squaduary – because why not? And thirdly, Alex (of Leadbaloony) has a small challenge-type thing of his own. Well, a couple of them, but these Orcs aren’t here for Fembruary. 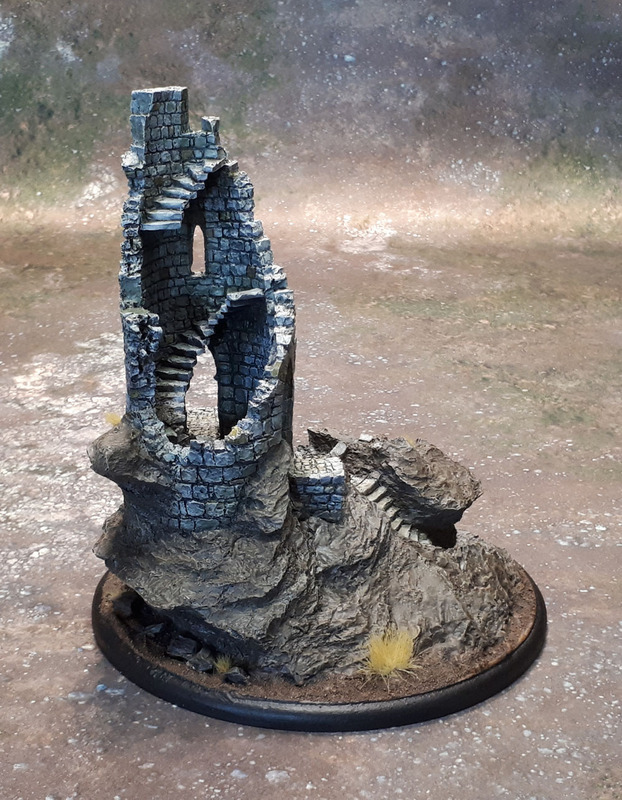 So I’ve decided to attempt to jump on board with Alex’ Tale-of-AoS-Gamers challenge, but as with all of these things that aren’t my own, I’ve had to bend and bastardise the rules to make it fit me, but them’s the breaks! Build & paint 100ish ‘renown’ points in Feb (to include our Generals), and 25ish renown per month thereafter, up to 250 pts. This should equate to a manageable 3ish minis per month. I’m going to use the Shieldwolf Mountain Orc hero that I painted only last month as my hero for the Bonesplitterz/Savage Orcs. He would count as a Savage Big Boss at 120pts, but that’s the closest that particular faction allows for a melee hero. Given that I had only that one Savage Orc painted, and only three “troop” models from that second faction, I’m going to call it “close enough” on both, here. 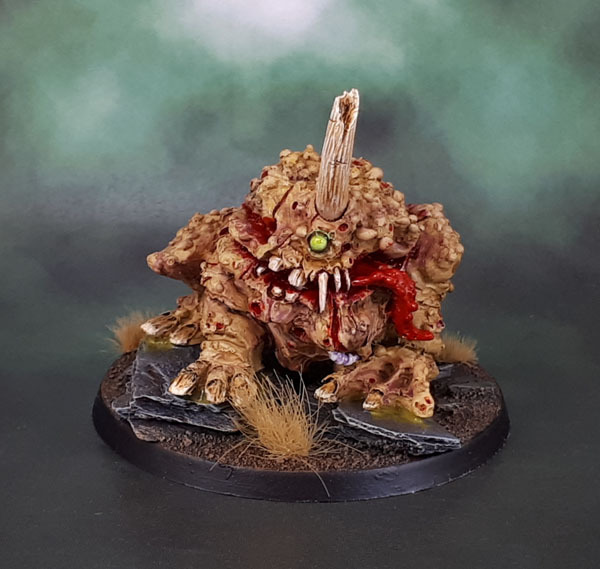 Push the modelling & painting – AoS28 style, crazy conversions, grim-dark, etc. Uh…. maybe not with the modelling, outside of duplicate models. I’m very loathe to cut up non-duplicate old classic metals after all – especially unless it’s going to be necessary to represent something special. Paint on the other hand.. I’m keen to continue the body paint of my orcs, and maybe see if I can find something interesting to do with the others with the brush. Lowest cost possible – beg/borrow/steal, freebees, scratch build, re-use, etc. Dipping into my existing collection of unpainted and neglected models here is a given. Narrative rather than competitive warbands – named characters, backstories, etc. 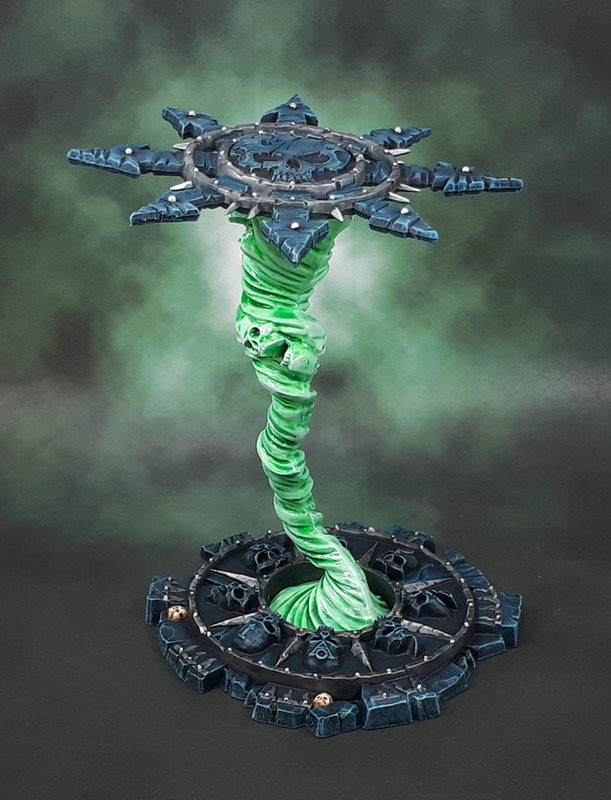 I’m not really one for writing background fiction for my models, though I do often name heroes and units – and more importantly go for models that are background-friendly as well as fun and interesting to paint over “competitive”. And here they are. So far. 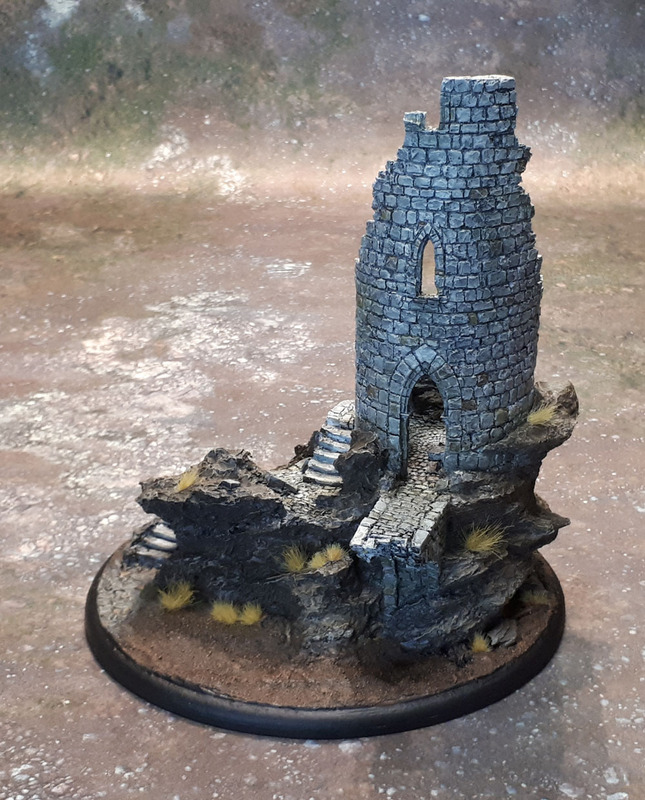 Not a GW kit for a change, today’s terrain piece is a ruined watchtower. I can’t tell you who produced it, though – as I picked it up quite a few years ago now in a job lot with a whole lot of other bits and pieces. 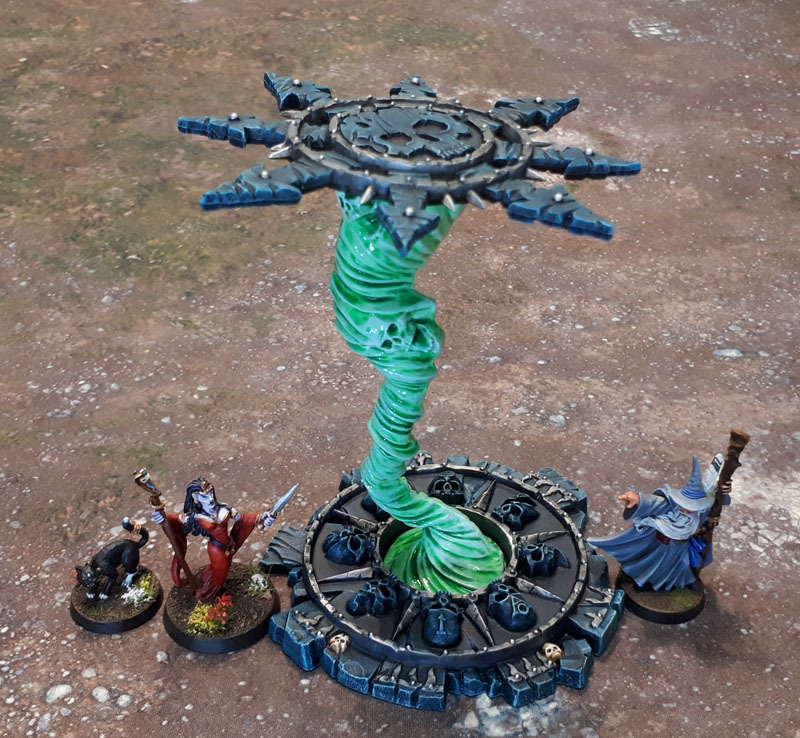 Speaking of pieces, it was in several until I finally assembled the thing earlier this month, with this month’s challenge and the good spraying weather finally motivating me to finally get the thing done! It went together simply, if not easily – with some drilling and clipping needed to get the pieces together. The different segments don’t fit together perfectly, but they’re close enough so that it can be difficult to notice. Once again, the sheen from several layers of varnish combined with a lot of lights belies the more matte appearance that it has in person. It looks almost like flowing mud here! What can I say? My lighting options for larger pieces are pretty shithouse! It’s kinda hard to see, but I’ve attempted to have the orientation of the grass on the tufts “flow” with he contours of the model, as the whole thing has a pretty windswept look to it. That big section where it looks like it’s fit together extraordinarily badly is part of the sculpt – it’s intentional – rather than being the result of my terrible modelling skills. I’ve mounted it on an inexpensive wooden teapot stand to give it a nice sturdy base, and rather than trying to bevel it to the ground or try to paint the edges in an awkward (to me) brown so it “fits in better” with my table surfaces, I just went full fuggit and gave it a similar black rim as I do with many of my bases. 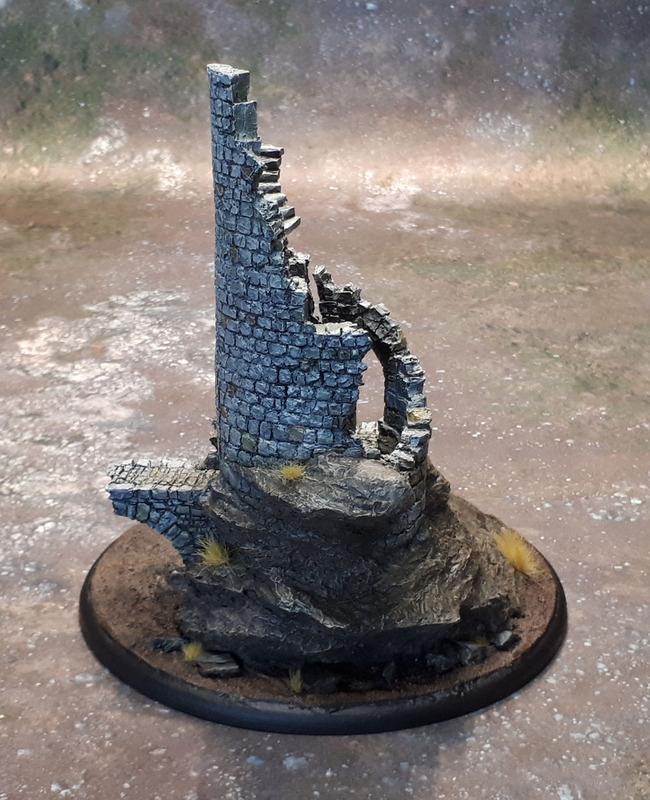 I did roughly sculpt some simple flagstones in the ground, giving the indication of a small path that may or may not continue on the battlefield surface. The scale of this model seems a bit smaller than most “heroic” scale models. Here we have it with a few Heroes of Men from the LotR range, with their slightly smaller scale showing the sizing. 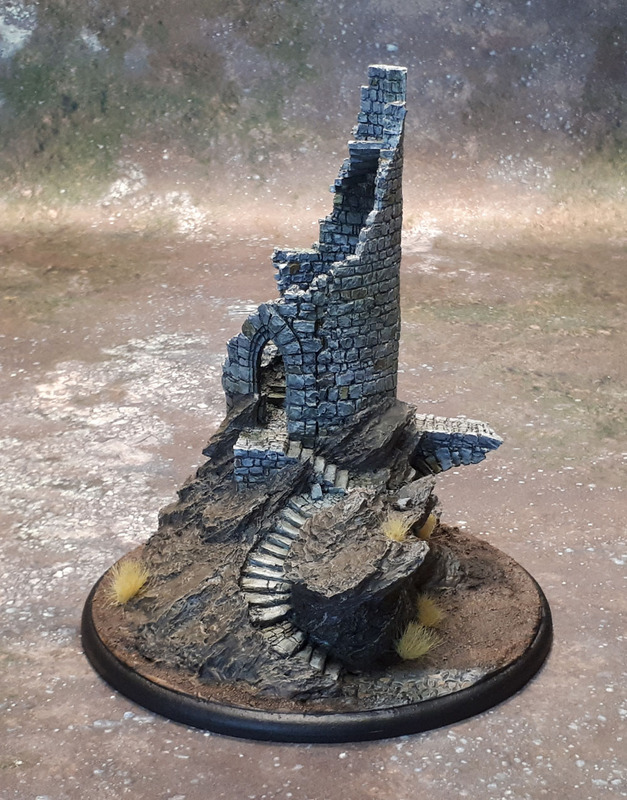 True historical models would be a touch smaller yet, so would fit in even more nicely with the tower. I also thought our friend The Imperfect Modeller would appreciate how close this almost gets to a proper diorama! I’d just need an appropriate figure to put in Gandalf’s place there, and a pin to hold them there on! 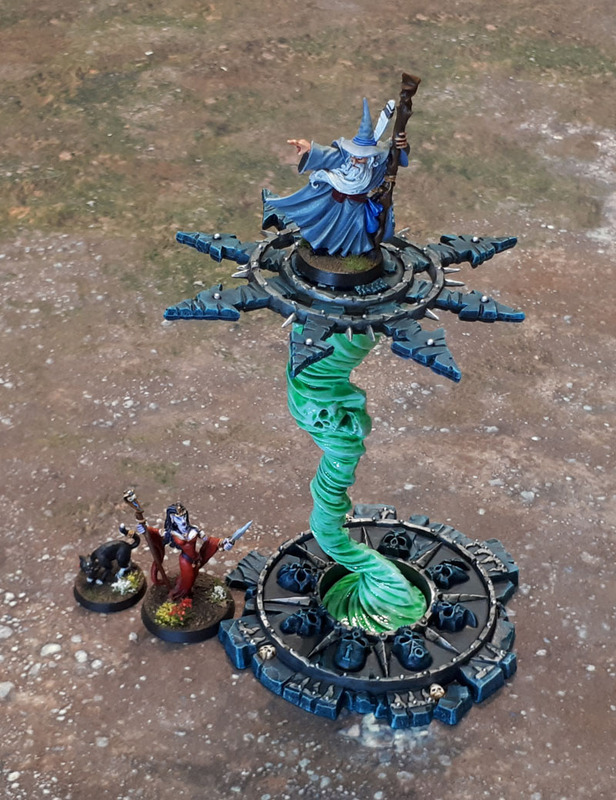 FInally, as a point of contrast, I thought a couple of more modern-scale AoS Bloodbound figures (ok, one is at least 50% Shieldwolf) would be a nice counter to the above – as you can see, it’s still very much usable for Fantasy of pretty much any stripe. 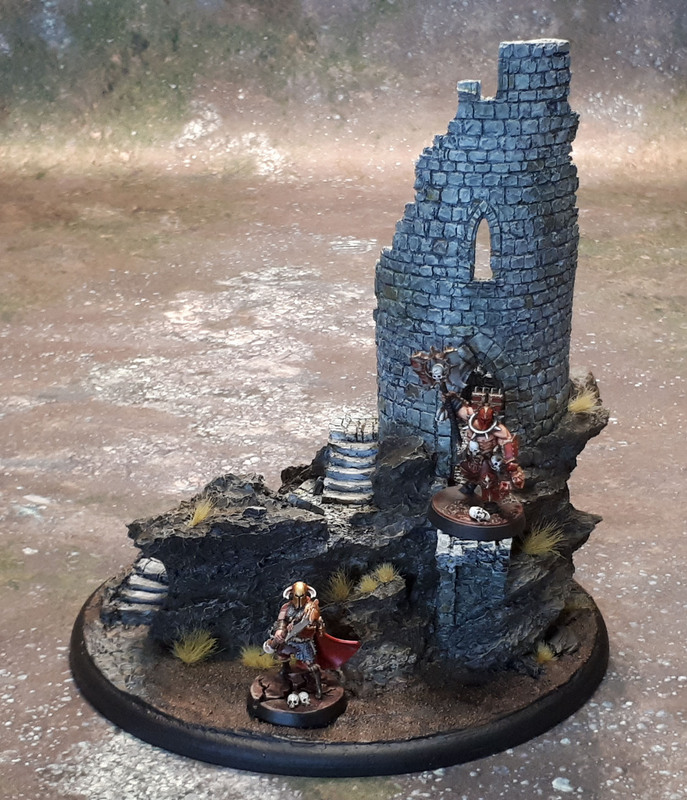 And the number of times that Space Marines have fought their foes over terrain that resembles Terra’s ancient medieval castles must be beyond count! 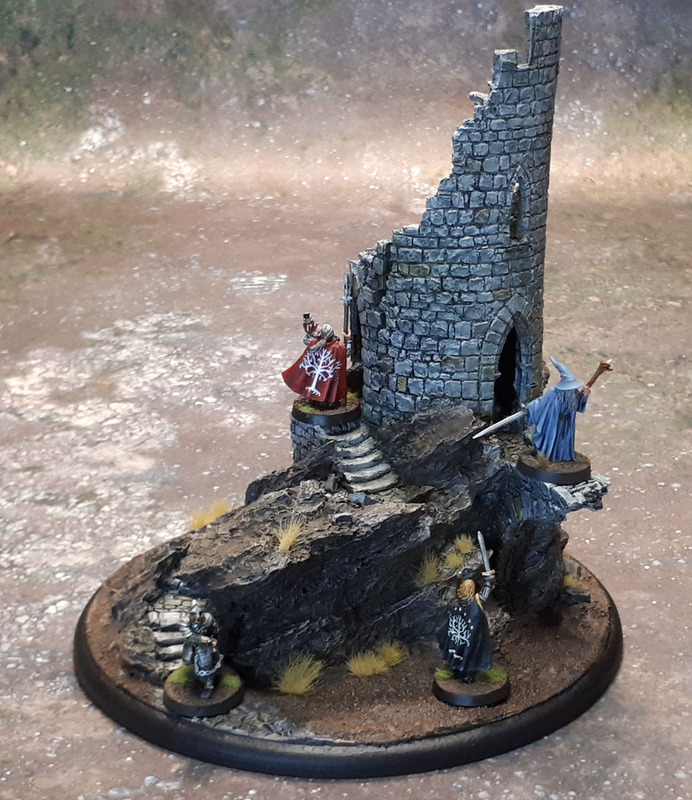 Today – Miniatures! Here’s the final three of my Plague Toads. This trio bringing me to nine painted ones. This batch being the “yellow” ones, following on from the “brown” ones and the “green” ones. And yeah, I know I need to do a new Nurgle army shot sometime soon. Individual glamour shots of each of the three, though I skipped the profile and rear shots this time. Perhaps I went a bit conservative on the “glow” from their yellow-green eyes this time as well, but I think they still stand up decently. You can see what I mean about it it here. It’s there, but it’s subtle. Perhaps too subtle to stand out on the tabletop. Ah well. I’m just happy to finally have the last* of these done finally! 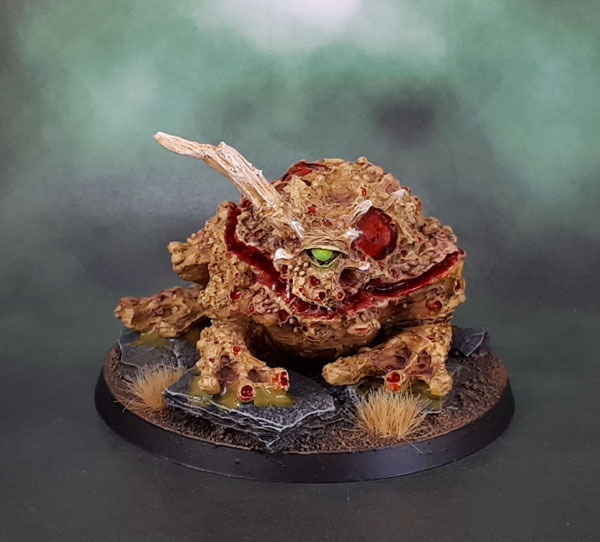 The nine of them, with their colour coding can be used as three distinct units of three, or they can all be put together to make up a mega-sized unit of nine Plague Toads! *of course, I didn’t say anything about Pox Riders! 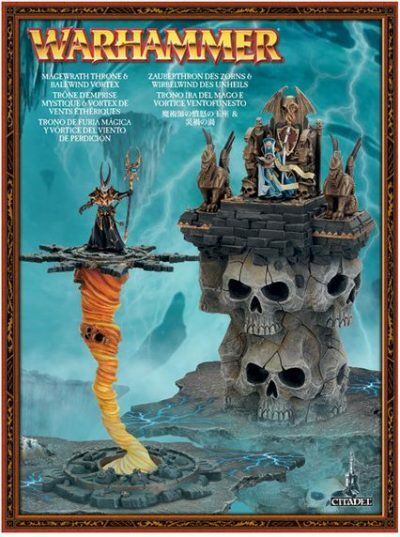 Originally released as part of a larger kit towards the final days of WHFB, alongside the Magewrath Throne (that used to sit atop a stack of giant skulls), the two have now been split into smaller kits, and the throne has lost it’s skull-riser. More on that in another post, later. 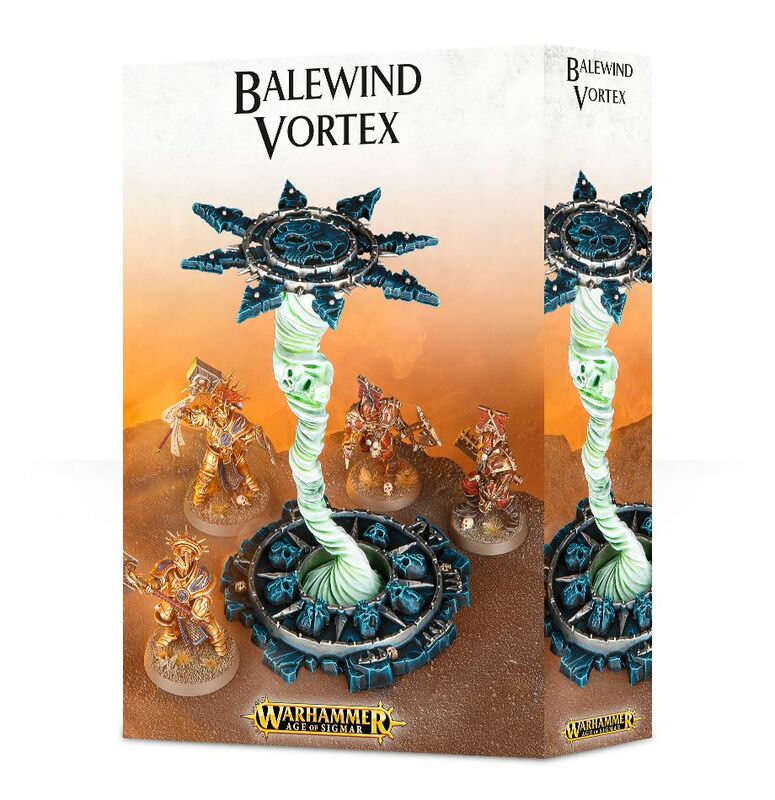 The Balewind Vortex is a simple terrain kit, coming in only 4 pieces. Base, Top and a two-part whirlwind. Or balewind, I guess. Having been fairly indifferent to the concept of The Winds of Magic since they were first introduced in that White Dwarf article, I was happy to basically copy the current box art. I quite like the greenish-shaded off-white look that GW has been using for much of it’s undead since the Return of the King’s Army of the Dead introduced the overall scheme and effect. Slightly embarrassingly, it seems that I ordered another one of these things a couple of weeks ago, before starting on this one, which has just arrived. I don’t know if I’ll be able to care enough about it to give it a yellow-red gradient like the one in the original Warhammer promo box, though – I’ll worry about my options there later!